This page provides an overview of our targeted online press release distribution, press release writing & social media marketing services. Thank you for your interest in our press release services. Since 1983 Neotrope®, a privately held company in California, has provided best-in-class personalized and targeted news distribution Direct-to-Editors™, along with professional press release writing by an accredited PR staff. With over 35 years of experience in both traditional and modern public relations (PR) practices, our company can help you “get the word out” about your business, product, service, or industry expertise as an opinion leader. 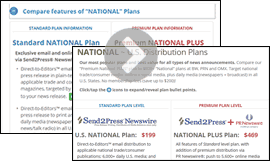 Send2Press® Newswire has been online almost 20 years, long before most of our competitors knew what a press release was. We have a superb track record and very high credibility in the news business. Our news runs on 200-300 websites with every service plan, and is also shared to all the top social media sites as well as Apple News, Bing News, and Google News. We provide superb reporting with direct-links to your story online, social media clips, and social click-through tracking with our PRTrax™ report dashboard. Since 1983 we've been helping clients of all sizes and from all industries “get ink,” plus raise awareness of their companies and brands. Over the past 20 years we've also specialized in raising online visibility. A full U.S. National Distribution Plan starts at $199. For over 30 years we've been helping our clients craft compelling messages to get in front of interested media folk. We've helped clients get major media coverage (“pick-ups”) in every conceivable venue including traditional magazines, newspapers, broadcast and blogs. We have used Send2Press for over a decade to reach the media and public on behalf of our clients in the insurance,and healthcare industries. Send2Press is large enough to command solid exposure through all media channels, yet small and agile enough for its team to work with us on a first-name basis and get our message out in ever-new ways, particularly innovative social media reach. This is vital as print media struggle and Internet options evolve. Pricing starts at $99 for a U.S. State distribution + syndication, or $199 for a National distribution plan (before discount). Full writing service $199. Writing + distribution just $349. If you've taken a look at some of the companies posting on those low-cost online blog-newswire sites, you likely notice the quality is lacking. In our case, over the past 17+ years, Send2Press has carefully selected who we choose to work with, turning away low-quality junk news. This gives us an unparalleled level of credibility in the news business. You're in very good company when working with us! Since 2005 we've been helping our clients use their press releases as “food” for social media marketing. Today, with most of our press release distribution plans, we include a social media promotion ($99 value); plus affordable upgrades to “social boost” your news. We can target your news to make sure the right people on Twitter and Facebook see your message! Targeted to Twitter and Facebook. Explore Service Plans: Review our press release writing and distribution service plans, pricing, and deliverables. Review Requirements: Review our minimum content and photo requirements, deadlines and FAQs. Order Services: In our secure order system, add desired service(s) to shopping cart and checkout. Submit Project: After checkout (payment), upload file(s) on our simple project form and schedule. Normal business hours: 9 a.m. - 5 p.m. PST/PDT, Mon. - Fri., in Calif. USA. IMPORTANT DISCLAIMERS: All services are pre-paid and ordered online, and are offered subject to our Terms of Service (TOS) and Acceptable Content Policy (ACP). Placement of news on any website is subject to that site's editorial policies. Social media outlets noted in features subject to change. Some news systems and/or aggregators may suffer service outages outside our control. Some systems, including Google News, may skip “stale or duplicate” news content or certain advertorial material; neither Send2Press nor PRN can “guarantee” placement on any specific news system or social media outlet listed in the Send2Press feature descriptions. Please see our Help/Getting Started (“Requirements”) for news content we will not accept. All transmitted news content will be conformed to AP Style where necessary without prior preview or approval and to meet our format requirements (see our Help/Getting Started for information; you may request AP format review at no cost for submitted projects). Thank you so much for putting us on the map as never before. Your access to major newspapers has been priceless in getting out our message. I have used Send2Press since 2003 because the team delivers an array of press release services beyond and above most. I refer every client to Send2Press. I adore the level of attention you give every release to make certain it does what it's meant to do. You'll be seeing more of me. Thank you. Send2Press has yielded interviews for me all over the globe, including the BBC, MSNBC, CNN, E!, People, The New York Times, Associated Press, and Reuters. Copr. © 1983-2019 by NEOTROPE® ~ all rights reserved. Send2Press® is an online newswire service of Neotrope and is a U.S. registered trademark and service mark. Neotrope is a registered trademark in the U.S. and Europe. Direct-to-Editors™, PRpurls™/PRpurl™ and PRtrax™/PRtracks™ are trademarks and service marks of Neotrope. All services offered subject to our Terms of Service (TOS). Proud to be a 100% U.S. company, located in Torrance, Calif., USA. Site Design by NEOTROPE®.